Historian John Flavel Mines described the Ludlow family in his 1918 Walks in Our Churchyards, saying "Descended from ancient and noble ancestry in England, they naturally became connected here by marriage with their social peers in the English colony--the Livingstons, Harrisons, Verplancks, Waddingtons, Ogdens and Mortons." In 1768 Carey Ludlow purchased the 52-foot wide property at No. 9 State Street from the heirs of Abraham Lymsen. It ran through the block to Pearl Street and, according to Appletons' Journal more than a century later, held "a fine Dutch house, with gardens, stabling, and out-houses." Ludlow, who was described as "a very wealthy merchant," envisioned a grand new residence on the property. But times were troubling. Three years prior to Ludlow's purchasing the property the Stamp Act had been passed and it sparked determined resistance in the colonies. Appletons' Journal explained "Carey Ludlow was so rank a Tory that from the first he declared for the legality of the proposed tax, and made himself so obnoxious to his fellow-citizens that he determined not to provoke remark by any ostentation in private life." Ludlow helped smooth over hard feelings by improving the residential waterfront. He planted more than 300 trees in the neighborhood around No. 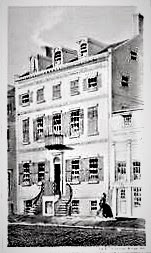 9 State Street, where he now began construction of his impressive Georgian mansion. 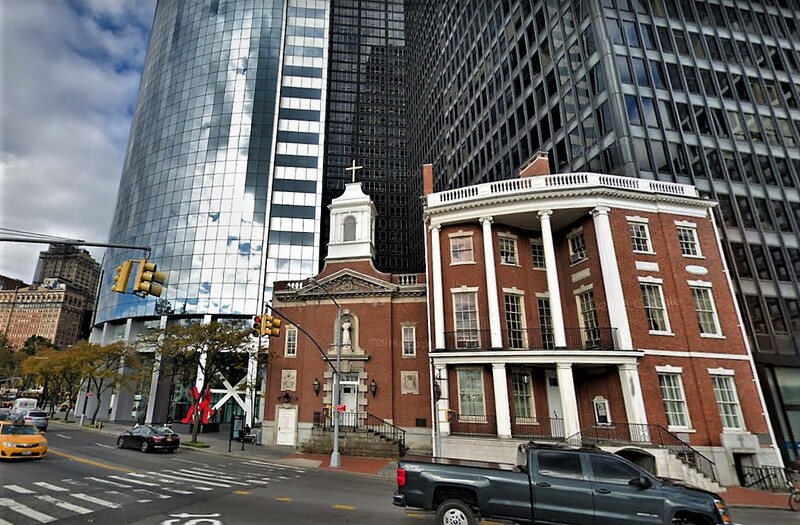 At the time his family was living on Front Street where, in 1791, his daughter Catherine, "a great beauty," was married to attorney Jacob Morton. The match proved that the families had let political bygones become bygones. 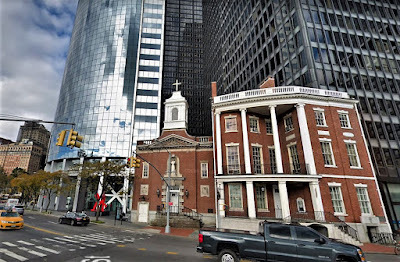 While Carey Ludlow had been a staunch royalist, the groom's father, John Morton, had been called "the rebel banker" by British officers for the large amounts of money he loaned to the Continental Congress. Although the State Street mansion does not appear in city directories until 1797, it appears to have been nearing completion at the time of the wedding. Appleton's mentioned "Mr. Ludlow, shortly after the marriage, removed to the house on State Street." Three stories tall, not including the attic and basement levels, it was a regal presence among the other State Street homes. A split staircase let to the porticoed entrance, above which was a charming half-round balcony. (Historian Martha Lamb remarked in her 1877 History of the City of New York, "The view of the bay was superb from the little balcony over the front door.") Three tall, arched dormers punched through the slightly peaked roof. Inside were 26 large rooms, plus the servants' quarters. John Flavel Mines wrote "Its oak chimney-pieces, wainscoting imported from England...made it a noteworthy edifice." Carey Ludlow was not one for grand display, and the furnishings were described as "somewhat plain." Although he and his wife do not seem to have often entertained grandly, the wedding of Eliza Susan Morton, the sister of their son-in-law, was an exception. Martha Lamb described the occasion in an 1889 article in the Magazine of American History. "One of the romantic social events of June, 1797, was the marriage of the celebrated Josiah Quincy to Miss Eliza Susan Morton," in the State Street house. The president of Princeton College, Rev. Dr. Samuel Stanhope Smith made the journey to New York to perform the ceremony. Carey Ludlow died in 1807, passing title to the house to his widow. Catherine and Jacob Morton moved in with the elderly woman and, according to Appletons' Journal, "the palmy days of the old house began." The couple, who not only had a considerable fortune but were "endowed with great taste," made the interiors even more magnificent. "They lavished marble decorations, and ormolu, and superb girandoles, over the principal rooms." The writer recalled that "from the windows of the banqueting-room, and from the rich drawing-rooms also, could be seen the Battery Park garden, where all the trees Mr. Ludlow had planted had by this time grown to a fair height. Morton's career by now had gone far beyond his legal practice. He was also a merchant and a major-general in the National Guard. 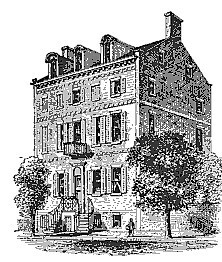 He and Catherine were among the most celebrated of New York City hosts, prompting historian Emmons Clark in 1890 to recall "Fond of society, and distinguished for his hospitality, [Jacob Morton's] house was for many years a social and fashionable center of great celebrity...All the distinguished men who visited New York were welcome guests at the superb mansion." Appletons' Journal added "No. 9 State Street was emphatically the centre of intellect, refinement, and feminine loveliness. Mrs. Morton had been a great beauty, and she delighted to assemble around her all the belles of the city, while her husband's wealth as a merchant, and distinction as a gentleman, brought to his house all the distinguished men of the time." Entertainments were put on hold when Morton, now a brigadier-general, rendered service in the War of 1812. In 1815 he succeeded General Stevens as commandant of the First Division of the National Guard. The single event for which the Morton house would be most remembered was the glittering ball held for Marquis de Lafayette in 1824. Emmons Clark described it as "unsurpassed in the country at that period." Peter Ross, in his 1899 A Standard History of Freemasonry in the State of New York, commented that the "grand ball [was] the last time, probably, on which its twenty-six apartments were all thrown open to guests." Following Jacob Morton's death in 1837 Catherine was offered $90,000 for the mansion--in the neighborhood of $2.38 million today. The offer was refused; however the once-elegant street was becoming increasingly commercial and the family left, leasing their mansion initially as an upscale boarding house. But by the end of the Civil War it was home mostly to Irish immigrant families. Appletons' Journal wrote "Lower and lower it went in the social scale. A thieving tenant would steal some marble; another would lay his hands on some rare carving, until, little by little, wainscoting, marbles, mantel-pieces--all were gone and the mansion was completely despoiled." Around 1868 the Morton family sold the beleaguered house for $28,000. It was operated by "Mrs. Perry." Among her Irish-born boarders at the time were the Glover family, Patrick Collins, Edward McEntee, and Michael Quigley. McEntee was injured when he fell out a window that summer. The New York Herald reported on July 21, 1868 "Edward McEntee, living at No. 9 State street, fell to the sidewalk on Sunday evening and broke one of his arms." A year later on July 28, 1869 Henry C. Glover and his son, Samuel, went to Michael Quigley's room and asked to borrow his gun. When he refused, according to his complaint to police, "they assaulted him with the gun, striking him several blows over the head." The Glovers were arrested. Both Quigley and Patrick Collins owned small rowboats which they moored at the foot of the park and rented. Three months before Quigley's encounter with the Glovers, Collins had had his own problems. On April 15 he rented his rowboat to two teens, William Shea and John Grove. The boys said they needed it for five hours and, according to Collins later, "left the Battery landing in high glee." He waited well past the appointed time, but they never returned. Nearly a month later, on May 8, they were arrested, charged with stealing the boat valued at $80 (nearly $1,500 today); and yet "neither of the prisoners would tell what they had done with the complainant's property," according to The New York Times. A mysterious advertisement appeared in The New York Herald on February 13, 1870: "Information Wanted--Of Mrs. Isabella Elliot, late from Derry, by steamship Caledonia. By leaving her address at Mrs. Perry's, No. 9 State street, she will hear of good news." Meanwhile Michael Quigley's problems continued. On July 14, 1871 he placed an advertisement in The New York Herald: "17 Foot Boat Stolen--From the Battery, Monday, 9th inst. painted white, red gunwale, blue streak, named Tommy Dodd; branded M. Quigley, Battery." He offered a reward "for the conviction of the thief" equal to $1,000 today. Michael Quigley jumped into action, launching his rowboat into the harbor. Although approximately 125 people perished that day, he was credited with saving several. But heroism did not translate into great reward. On September 5, 1871, The New York Times reported "Michael Quigley, of No. 9 State-street, who did such good service in he work of rescuing the victims of the Westfield, was a complainant yesterday before Justice Dowling, against John Williams of No. 46 Vandam-street, whom he charged with stealing his gold watch." According to Quigley's testimony, he was standing at the Battery on that previous Sunday afternoon, "having in his vest pocket a gold watch worth $60." (A significant $1,240 in today's dollars, considering Quigley's blue-collar status.) The New York Herald said that Williams "had a predilection for the watch [and] quietly withdrew it from Quigley's pocket." He had not gotten far before Quigley realize his pocket had been picked. The ill-fated Quigley would have to find other accommodations before long. In April 1874 architect John Correja filed plans for a five-story tenement building on the site for developer Patrick Dollard. The Ludlow-Morton house, once one of the most celebrated residences in the city, was demolished with no comment in the press. Today the site is part of the plaza of the 42-story 17 State Street. The large red curbside bow unintentionally marks the approximate site of the Ludlow mansion. Almost unbelievably, the neo-Gothic commercial building is the result of the remodeling of two 19th century rowhouses. By the middle of the 19th century imposing homes of Manhattan's wealthiest citizens were creeping up Fifth Avenue towards 23rd Street. In 1850 mason Joseph Sanford embarked on an ambitious project of constructing five speculative dwellings on the east side of Fifth Avenue, between 19th and 20th Streets. Even before construction was completed in 1851 Sanford had sold No. 127 to commercial banker John B. Murray. No. 125 was sold later that year to portrait painter and miniaturist Thomas Seir Cummings. The esteemed artist held the posts of vice-president and treasurer of the National Academy of Design. Cummings' wife, Rebecca, was an amateur artist. The couple had three children, sons Charles and Thomas Augustus--also artists--and daughter Cora. The population of the house was reduced by one following Cora's fashionable wedding to Lemuel W. Morse in Trinity Chapel on January 7, 1863. The Cummings' next door neighbors would have an impressive house guest later that year. Brigadier General Thomas Francis Meagher recruited and led the Irish Brigade and was highly responsible for the large numbers of Irish immigrants who led support to the Union. When he briefly visited New York in the summer of 1863 he stayed with the Murray family at No. 127. Dr. James Chilton purchased No. 125 from Cummings in 1857. Like many physicians, he was also listed as "chemist," or pharmacist. Chilton died in 1869, but his wife, Mary, continued to live on in the house. The Grand Jury, I regret to say, made a mistake in not indicting you for burglary. Had you been indicted for that offence and convicted, I should sentence you to twenty years in the State Prison. I wish the lawless portion of this community to understand that hereafter [I] will hold that any man found concealed in a dwelling-house for burglarious purposes...on conviction will be sentenced to twenty years. Only two months later it was the Murray house that was burglarized in the same manner. On October 7, 1870 The New York Times reported "On Wednesday night the residence of Mr. John B. Murray...was robbed by a thief who had secreted himself in the house during the day, and left by the front basement door." What was utterly amazing was the boldness of the thief. Because Rebecca Murray was seriously ill, "the house was lighted from top to bottom all night," according to the newspaper. "Every room was occupied and every room door wide open, and the nurses passing from room to room, as in the day-time." Nevertheless, the thief tried hard to jimmy open the safe containing the silverware (although he finally gave up), and made off with "large sum of money, a chronometer watch...and a quantity of clothing and jewelry." The Times concluded "The audacity of the thief is remarkable." After living at No. 127 for more than 25 years, Murray lost it in foreclosure in 1878. It was acquired by millionaire Robert Livingston, who did not live in the house, but leased it. His first tenant was the newly-wed lawyer Robert C. Fellows, who had married Mrs. Phoebe Robertson on February 28 that year. The marriage would give the attorney serious headaches. Phoebe had not only neglected to mention that her former husband was not dead; but that they were not yet divorced. A complex tangle of legalities followed. Fellows left Phoebe and filed for annulment; and Phoebe briefly returned to her former husband but when he died in the summer of 1879, she and Fellows remarried. The two were still in court in 1880, however, when they battled over whether or not to continue the original annulment proceedings. While they tried to explain it all to a judge, Mary Chilton was in the process of selling No. 125. By now commercial interests were inching up the avenue and before long the ground floors of both houses were converted for business purposes. In 1881 the society dressmaker and costumer T. W. Lanouette opened her shop in No. 125 and lived upstairs. Simultaneously, real estate operator brothers Max and Moses Ottinger purchased No. 127 on March 21, 1881 for $44,500--just over $1 million today. The ground floor shop became home to Edward Favier's European art gallery. The upscale nature of his business was evidenced when his gallery was robbed by "two well-dressed young men" in February 1883. The men admired several paintings, including a small piece by Eugene Fichel which was temporarily out of its frame. Favier had it priced at over $12,500 in today's money. After they browsed and promised to come back to buy another painting, the Fichel work was discovered to be missing. Small businesses eventually took over the upper floors of both houses. In 1894 Herman Bergdorf and Herman Voight opened their tailoring and fur shop in No. 125. 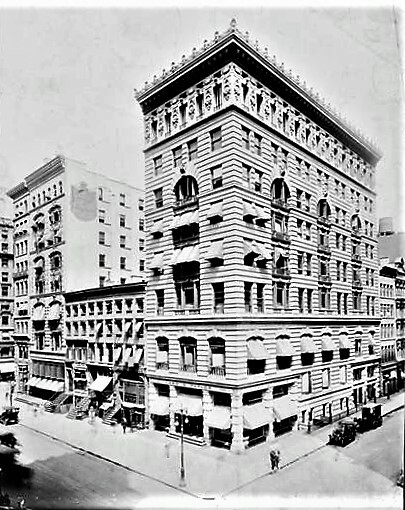 The building was almost demolished in 1903, after Bergdorf hired Alfred Zucker to design an 11-story store and loft building on the site. The plans, filed in December 1903, projected the cost at $132,000. But for some reason Bergdorf changed his mind. In April 1903 he sold the building, which continued to house shops and offices. On February 4, 1921 the Domestic Lunch Corporation signed a lease for both buildings. The company no doubt intended to remodel the ground floors into a spacious luncheonette. But, like Benjamin Bergdorf, it quickly changed course. Three months later The New York Times reported it had sold its lease to the Shapanka Realty Corporation. "The new lessee will erect a new five-story and basement building with an elevator at a cost of $50,000," the article noted. If, indeed, Shapanka Realty intended to demolish the old converted houses, it never happened. Instead architect Irving Margon stripped off the facades and rearranged the interiors to create a business building behind a 1920's take on neo-Gothic architecture. Nestled among tall loft buildings, the joined buildings retained their original height and proportions. Each address contained a storefront at ground floor, separated by the entrance to the upper floors. Entire clad in terra cotta, the spandrel panels between each floor featured Gothic quattrefoils. The parapet, decorated with blind arches and ornamental carvings, sprouted Gothic pinnacles topped with crockets. The store of No. 125 was home to I. 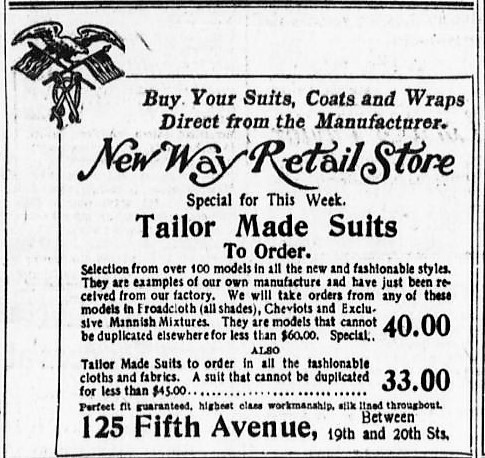 & H. Gold, Inc. men's clothing; followed by the United Balloon Company in 1938. W. R. Price, Inc., toys and maps, moved into No. 127 in 1922. The upper floors were leased as offices until 1929, when they were converted to permit light manufacturing. The ever-changing Fifth Avenue saw The Mask, a children's theater, in the building in the 1960's and early '70's, followed by China Books and Periodicals in 1972. It remained through the 1980's. The 21st century brought expected updates, like replacement windows and a remodeled storefront. But on the whole Irving Margon's 1921-22 makeover is intact. That the bones of the combined buildings date back to lavish 1850's residences is impossible to detect. The last survivors of the row of houses flank the carriage house. No. 171 at left retains its cast iron veranda. 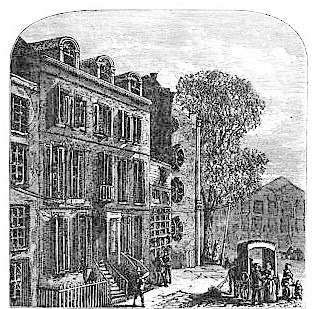 Shortly after James Lenox began selling off his father's 30-acre farm as building plots in 1864, a row of 20-foot wide Italianate rowhouses appeared on the north side of East 73rd Street, between Third and Lexington Avenues. Three stories tall above English basements, each brick-faced home featured a handsome cast iron veranda. The owners of No. 173 took in at least one boarder in 1879. The fact that the well-educated woman preferred to barter tutoring for rent may have caused problems, however. On September 28 that year she was looking for other accommodations. Her advertisement read: "A lady with highest testimonials desires Board in exchange for music, German or English lessons." Change to the respectable, if not fashionable, block began as millionaires began filling the Fifth Avenue neighborhood across from Central Park with lavish mansions. Property on what would become "stable blocks" was simultaneously purchased for the erection of private carriage houses to quarter their teams of horses, several vehicles and certain stable employees. The East 73rd Street block became on of those stable blocks before the turn of the century. In 1893 No. 173 was replaced by a three-story stable designed by Hobart H. Walker. Clad in gray brick and trimmed in limestone, it was a late interpretation of the Romanesque Revival style. Hobart creatively used the brick at the ground floor to imitate rusticated stone, and then turned them on their sides to produce a sunburst of voussoirs over the bay doors. Above the arched openings of the third floor a brick parapet with recessed panels was crowned by a cornice. The carriage house was owned by Gustave Reismon. Following his death his family sold the property in April 1903 to J. Henry Alexandre, owner of the Alexandre Steamship Line and vice-president of the National Hunt and Steeple Chase Association. The carriage house was conveniently close (but far enough away that the odors and noises did not create an offense) to the Alexandre mansion at No. 35 East 67th Street, which he had purchased just three months earlier. .
Alexandre and his wife, the former Elizabeth Lawrence, had five children, J. Henry, Jr., Mary, Elizabeth, Virginia, and Frederick. The family's summer estate, Valleybrook Farm, was in Old Brookville, Long Island. There Alexandre kept a stable of thoroughbreds. And while many millionaires dabbled in horse racing, J. Henry Alexandre was equally involved in the aristocratic sport of polo. Elizabeth Alexandre died on January 3, 1906. Three months later J. Henry's stable manager, I. Brennan, was looking for a new coachman for his boss. 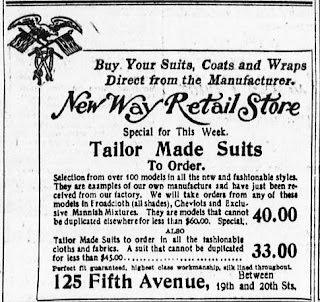 His advertisement on March 24 in the New-York Tribune reflected Alexandre's interests. "Coachman--Young man; good driver and rider; understands polo ponies; 10 years' experience." J. Henry Alexandre died in 1912; however his family retained ownership of the stable. In 1938 they hired architect Irving Kudroff to convert it for business. His plans called for a garage for three cars "and shop" on the ground floor, a shop and office on the second, and a one-family apartment on the top floor. By the time the Alexandre family sold No. 173 in 1951 actor Martin Kosleck and his wife, Eleonora Mendelssohn, lived in the apartment. He had fled Germany in 1931 after being placed on the Gestapo's list of "undesirables." His intense hatred of Adolph Hitler and the Nazis resulted in his convincingly playing several Nazi villains in motion pictures. He was also successful in television and on the stage. Eleonora was an actress and the great-granddaughter of composer Felix Mendelssohn. Eleonora had been best known on the German stage. The couple first met in 1931 when they both appeared in the Berlin production of A Woman's Sacrifice. They married in the U.S. in 1947. On January 3, 1951 Kosleck and a friend, Christopher Drake, talked late into the night in the living room after Eleonora went to bed. Shortly after Drake left at around 3:00 a.m. Kosleck attempted to adjust a window which apparently was letting in the cold winter air. He lost his balance and fell out, catching the window sill with his fingers. Drake had made it only a few feet down the street and rushed back, hearing Kosleck's calls. But before he could make it back to the apartment, Kosleck lost his grip. He was taken to the Metropolitan Hospital with a fractured leg, broken spine and internal injuries. Her husband's condition weighed heavily on Eleonora. The 51-year old actress had trouble sleeping. 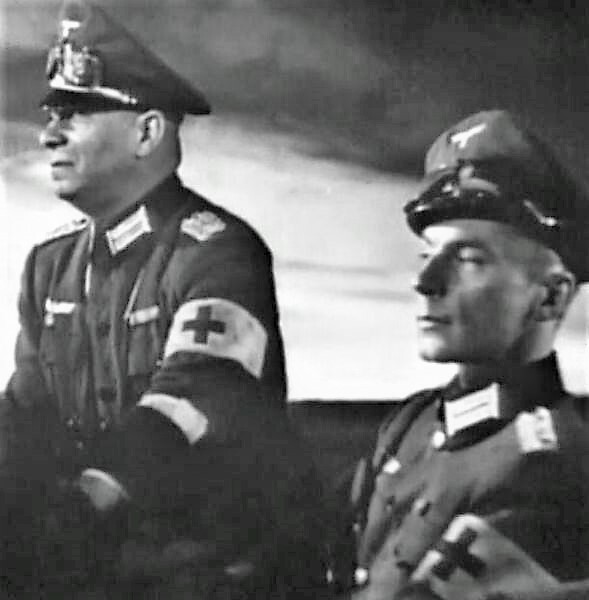 For emotional support a friend, actor and director Hans Heinrich von Twardowski, moved in while Kosleck was hospitalized. To help her fall asleep Eleonora depended on sleeping pills and ether--a somewhat commonplace, if dangerous, method at the time. At 10:00 on the morning of January 24 Twardowski found her dead in her bed. The New York Times reported "He said she had soaked a cotton pad with ether, placed it over her face, and had covered the pad with a towel and a bath mat." The newspaper added "Mr. Kosleck, who is in Metropolitan Hospital, was not informed of the death of his wife." Ironically, Kosleck recovered from his severe injuries and went on to appear in more than 80 motion picture and television roles. He died at the age of 89 in January 1994. Kosleck gave up the 73rd Street apartment. On July 26, 1952 The New York Times reported that Kathleen Dell Mauck had married Cabot Ward Low the previous day. 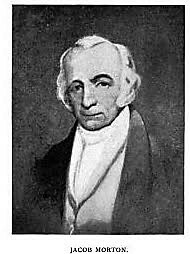 The bridegroom was the grand-nephew of former mayor of New York, Seth Low. Both he and his new wife came from socially prominent families. The newspaper noted "After a wedding trip, the couple will reside at 173 East Seventy-third Street." Early in 1964 the car shop and garage became home to Gallery PVI. The Times art critic Brian O'Doherty gave it disappointing coverage. On February 29 he wrote that the gallery "looks like it could be a lively place, although the art there at the moment is more promising that fulfilling." He complimented on piece, saying "There is also a brilliant piece of movable sculpture by Philippe Hiquily, whose motion depends on the transfer of a metal bubble through a series of dipping arms shaped like cestas, jai alai baskets." The original cornice was removed sometime in the 20th century. Like many of the former carriage houses along the remarkable block, No. 173 was converted to a single family resident in 2006. The ground floor which once housed horses, then cars, then artworks, was renovated as the family's two-car garage--a rare Manhattan convenience. Brothers William E. and Freeman Bloodgood made a good partnership. Freeman was a builder and his brother an architect. They established Bloodgood & Bloodgood which both designed and erected buildings--quite likely saving developers money. As early as 1880 John I. Lagrave owned the commercial building at No. 179 Duane Street. In 1885 he and John J. Jenkins, who owned the structure next door at No. 177, embarked on a cooperative project. They hired Bloodgood & Bloodgood to design and construct a modern loft building on the combined properties. Using the name F. & W. E. Bloodgood, the partners filed plans in March that year. They called for "one six-story brick store," 50-feet wide, to cost $18,000, or just under $475,000 today. Their employers may have been stretching their finances a bit thin on the project. In August John J. Jenkins took out a mortgage for the full construction amount. Completed within the year, the structure was an attractive industrial take on the neo-Grec and Queen Anne styles. The elaborate cast iron Corinthian columns expected in the storefronts of a generation earlier were gone, replaced here by geometric, paneled columns which upheld a beefy entablature and cornice. The upper floors were clad in red brick, highlighted by stone trim. Slim keystones were embellished with incised decorations, emblematic of the neo-Grec style. Queen Anne stepped forward at the top, where an elaborate terra cotta parapet took the place of a cornice. Here a row of tiles sprouted large, stylized sunflowers. 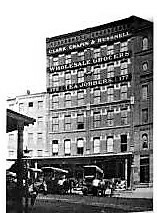 The building became home to Clark, Chapin & Bushnell, wholesale grocers. As was common, the firm painted its name across the front of the structure. 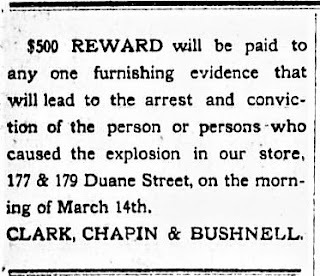 As the 1890's dawned, Clark, Chapin & Bushnell, like most of its neighbors, became the victim of corrupt cops. As drays pulled up to deliver or load crates of goods, policemen would move in, demanding payment for "the use" of the sidewalk. In 1894 the State Senate established the Lexow Committee to investigate police corruption. 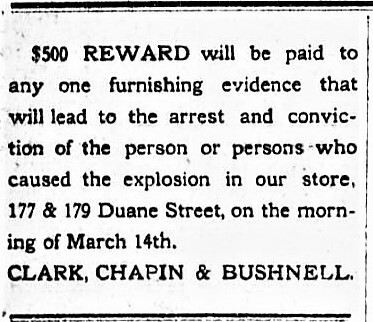 While some businessmen were reticent to testify, no doubt fearing retribution, that was not the case with Clark, Chapin & Bushnell. On June 22 the firm's manager, Andrew J. Wellington, testified "We were very much annoyed by the police about one year ago. A policeman came into the store and said that if wanted to back our trucks across the sidewalk there was a party in authority who would have to be paid. A man called the next day. He was not in uniform and I did not know him. He said there was a regular fee to be paid, generally $50, for houses having so much frontage on the street, but ours would be $25." The payoff would equal $700 today. The labor unions which were taking root at the time gained power by the turn of the century. The disparate interests of the workers and management sometimes boiled over into ugly and violent clashes. When teamsters went on strike in December 1905, Clark, Chapin & Bushnell refused to give in to their demands. They simply fired those on strike and hired new drivers. It did not sit well with the union. But, recognizing the potential of danger to its new employees, the firm put an armed guard on each truck. Early in March 1906 the strike seemed to have been settled, and the guards were released. The union men then launched a series of attacks, landing ten drivers in the hospital, one of whom would not survive. In that case, a gang jumped onto his truck, beat him with heavy cotton bale hooks until he was unconscious, then threw his body into the street. Then, at around 4:15 on the morning of March 14 a massive explosion occurred at the Duane Street building. 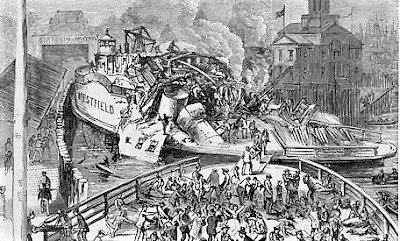 The New York Times reported "The entire shipping department was destroyed by the explosion. The dynamite was thrown through a door opening on the street, the wire screen to which was wrenched off on Monday night and the glass panel broken." The Evening World said "The vibration was so great that it was heard for a radius of half a mile." Damages were estimated at $1,000, about 28 times that much today. Ericsson F. Bushnell placed the blame on the shoulders of what today seems an unlikely target. He ranted to reporters "I believe that if any one man more than any other can be blamed for the labor outrages of to-day that man is Theodore Roosevelt. He has given the hoodlum element in labor circles the swelled head by interfering in coal strikes and by consorting with strike leaders." The ongoing labor feud may have contributed to the heart attack suffered by the firm's principal partner. On April 25 The Times reported that "Frederick C. Clark, head of the firm of Clark, Chapin & Bushnell, 177 Duane Street, one of the oldest tea importing firms in New York City, died in his home in this city this afternoon of apoplexy." The union had not yet made its point. On July 22, just before midnight, a second bomb exploded. The New-York Tribune reported "An attempt was made last night to wreck the warehouse of Clark, Chapin & Bushnell, wholesale grocers, at No. 177-179 Duane street. Dynamite was used." The damage was less severe this time. "A hole about big enough for a cat to crawl through had been torn in the lower part of the steel sheathed oak doors. In the stone flag which made the threshold of the door a jagged hole about a foot long and four or five inches wide had been torn straight through into the basement." After two bombings, Police Officer Artemus Fish was posted on the block to keep watch on the building. He thwarted a third attempt on the night of August 6 when he saw 24-year-old John Malone and 23-year-old Morris McAleer approach the building, and then loiter there. Both had been employed as truck drivers for Clark, Chapin & Bushnell before the strike. Fish walked up, flashed his shield, and ordered the men to "beat it." He later explained the men replied "Beat it? We'll beat you for a change." They then pulled out heavy metal truck spokes from their trouser legs and began pummeling the officer. His cries for help were heard by two other beat cops, who arrived just in time. Fish was nearly unconscious and bleeding from head wounds and other injuries. Both men were captured and charged with the March bombing. The union's violent methods did not work. On the contrary, they steeled the already-adamant Ericcson Bushnell against organized labor. He was in the courtroom the following day and, according to The Sun, "He declared his firm would fight them with its last dollar if necessary and never would recognize the union." 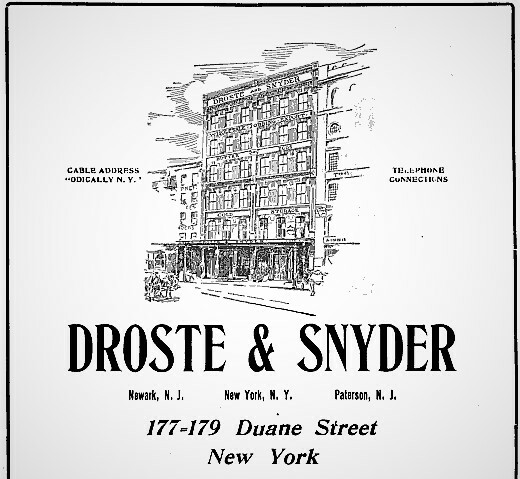 In 1909 Clark, Chapin & Bushnell was joined in the building by Drose & Snyder, wholesale butter and eggs merchants. Headed by Charles F. Droste and James H. Snyder, it had branches in Newark and Paterson, New Jersey. The firm not only moved in, but purchased the property. Clark, Chapin & Bushnell remained on until around 1914. Charles F. Droste kept himself busy. In addition to being the head of one of the largest egg and butter operations in the Northeast, he was president of the American Paper Goods Co. and the Troy Cold Storage Co., and a director in Rock Island Butter Co. and Lawlor & Cavanaugh Co.
Reporters regularly sought his expertise to explain fluctuations in the market. When egg prices dropped in 1911, he explained prices were driven by supply and demand--there were simply too many eggs that year. "I do know that our warehouses are full of goods, and there is no market for them, and that we are facing a new season." Eggs, unfortunately for wholesalers, were not like coats or shoes--they lasted only so long. And when prices skyrocketed in 1916, Droste was once again called upon by reporters. He told Dairy Produce what he had said five years earlier--it was all supply and demand. "There are comparatively few eggs in the warehouses than were there in April...so that the eggs we now have in storage cost us considerably more than those in April." While elevators were a welcomed convenience in the early 20th century, there were few if any safety regulations. Many elevators in industrial buildings did not have doors or gates, a condition that regularly resulted in injuries and deaths. On December 8, 1919 The Evening World reported that Teresa Vindora had died in the Duane Street building. "She was working on the fourth floor and it is believed she peered into the elevator shaft to look for a car and lost her balance." Charles F. Droste died on April 19, 1920, but the firm continued on without its well-known head for another five years. On June 17, 1927 The New York Times reported the cheese importer Otto Roth had leased No. 177-179 Duane Street "for a long term of years and the building will be extensively renovated to suit the requirements." In calling the lease "a long term of years" the newspaper was not wrong by a long shot. Thirty-five years later, on August 5, 1963, The Times wrote "There are so many cheeses in this world that it would be virtually impossible to catalogue them all. However, if a cheese is produced on a fairly extensive commercial basis, it is likely to be on the list of Otto Roth & Co." The firm was celebrating its 100th anniversary at the time, and dealt in more than 300 varieties of cheese from about 15 countries. The article's author, Nan Ickeringill, described each floor of the Duane Street building as "cheese-perfumed." Each of the cheeses demanded different care. Cheddars sat on racks as they aged. "We age the Cheddars here for about a year before selling them," explained president Benjamin Villa. "After the cheeses have been cured, they are dipped into dark paraffin to distinguish them from unaged cheeses." Ickeringill wrote "In another room, Provolone cheeses festooned the ceiling in quantities reminiscent of balloons at a New Year's Eve dance." On a lower floor were "sacks of cartwheel-sized" Swiss cheeses. But even as Ickeringill wrote her article, changes were coming to the old egg and butter district. In 1979 the Harry Wassermann bakery operated from No. 177. Its puff pastries were recommended by Dublin-born chef Pat Moore for authentic steak and kidney pie. Next door was Damon Brandt's gallery of tribal and ancient art. In 1998 the "cheese-perfumed" building which for for 113 years had been home to wholesale grocery and dairy merchants was converted to two cooperative apartments per floor. Despite terrorist explosions and a century of neighborhood change, the facade of William E. Bloodgood's handsome loft building survives essentially intact. In July 1822 the first case of yellow fever was reported in New York City. Within only a few days it had become an epidemic. The death toll reached 140 victims per day, churches and businesses were closed, and those with enough money to do so fled the city, many heading to the healthful environs of Greenwich Village. The explosion in population required additional homes, churches, banks and shops. Developers who rushed to erect new buildings were joined by unexpected speculators. Among them was a cartman--a driver of a horse-drawn delivery drays--Tunis Banta. In 1827 he erected a 21-foot wide, two-and-a-half story house at No. 529 Hudson Street between Charles Street and Amos (later renamed West 10th) Street. Faced in red Flemish bond brick, its parlor floor sat above a brownstone stoop over an English basement. Banta originally leased the house. By the late 1840's it was home to the young couple Joseph P. and Phebe Ann Brouner. Joseph was well-known in the neighborhood for his religious involvements. His father, Jacob H. Brouner, had been pastor of the North Baptist Church on Christopher Street nearly since its organization in 1827. Joseph was a deacon and the choir director in the church. His brother, John J. Brouner, was a Baptist minister, as well. The couple was plunged into grief when their son, Jacob, died on Tuesday morning, June 11 one month after his sixth birthday. The little boy's funeral was held in the house the following afternoon. The Brouners would have three more children--Howard Osgood, Maria Louisa, and Caroline--but sadly would attend the funerals of two of them. Howard was just over one year old when he died on June 22, 1863; and Caroline was 23 and recently married when she died in October 1879. When Maria Louisa was married to James L. Smith in her parents house in September 1873, her uncle performed the ceremony. By then the Brouners had lived on Sixth Avenue for at least a decade. In the mid-1850's the owner of their former home was offering rented rooms. An advertisement in The New York Herald on April 25, 1856 read "A gentleman and his wife and a few single gentlemen can be accommodated with good board and pleasant rooms, at 529 Hudson street, near Charles." It was possibly Elizabeth (known as Eliza) Blauvelt Froeligh who advertised the rooms. She was the widow of Solomon Froeligh, Jr., whose father left an indelible mark on the Dutch Church by sparking the "Great Schism" which resulted in the Reformed Dutch Church. Eliza's husband died in 1861 and certainly by that time she was living at No. 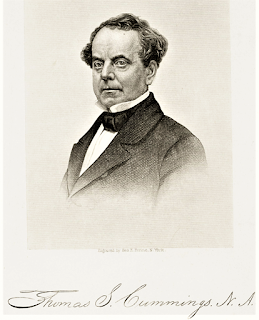 529 her son, William Blauvelt Froeligh. The Froelighs' ownership of the house had its roots before its construction. When Tunis Banta erected No. 519, another cartman, Isaac C. Blauvelt, simultaneously erected No. 531 next door. The two men had purchased the plots from Richard Amos (whose family lent its name to Amos Street) in 1826. Blauvelt's sister was Eliza Froeligh and their father, Rev. Isaac Blauvelt had been closely involved in the Dutch Reformed secession with Solomon Froeligh. Another funeral was held in the house on June 23, 1863 after William Froeligh died at the age of 26 two days earlier. 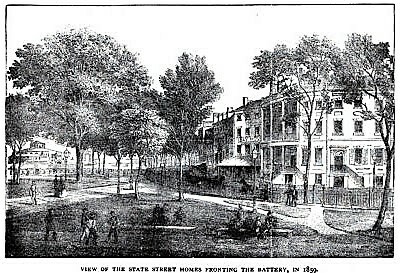 An advertisement in 1869 revealed the home's up-to-the-minute amenities. "To Let--Two rooms, neatly furnished, suitable for housekeeping; good closets, gas and water; price, $8 per week." The weekly rent would be equal to about $148 today. The house saw a variety of residents throughout the rest of the 19th century. In 1874 Dr. Gilford M. Morse and his wife, Emma, lived here. That year on July 6 he was appointed Surgeon of the 55th Regiment Infantry. And the women's activist Carrie Williams was here in 1882. She made herself a thorn in the side of department stores that February. Carrie and Emma Gates Conkling, who lived nearby at No. 160 Waverley Place, embarked on their own undercover investigation of the working conditions of shop girls. A workplace law demanded that "employers of females in any mercantile or manufacturing business or occupation to provide and maintain suitable seats for use of such female employes." Carrie and Emma wanted to ensure the rules were being obeyed. It all started when Emma noticed "with pity that the poor girls who are employed as saleswomen in the large retail dry goods establishments are compelled to stand from an early hour in the morning until late at night behind the counters," as she explained later. She and Carrie launched their own investigation and after visiting numerous department stores and questioning the women clerks, they headed off to court. On February 18, 1882 they obtained arrest warrants for executives of John Daniell & Son, on Broadway; R. H. Macy & Co. at 14th Street and Sixth Avenue; and Simpson, Crawford & Simpson on Sixth Avenue. In court John Daniell asserted that the charges were "inspired by malevolence." Surprisingly, a group of store employees appeared to support their employers. The New York Times reported "they said they did not need the interference of any body of ladies in their behalf, and added that the greatest kindness that ladies could do them would be to finish their shopping before 5 o'clock in the afternoon, that they might get the goods back on the shelf and be ready to depart at 6 o'clock." A contractor, or "builder," Edward Towner, lived in the house in 1887 at a time when Hudson Street was changing from one of quiet residences to a business thoroughfare. In the spring of 1899 real estate operator Charles Spear, head of Charles Spear & Co., purchased the house, placing its title in the name of his wife, Emma. By the time they sold it to John M. Foote in February 1902, they had increased its height to a full three floors above the basement level. The property was sold at "voluntary auction" in 1910 and purchased by Charles Winter, who soon made significant renovations. His architect, William S. Boyd filed plans in March 1911 to replace the front and rear walls of the basement and convert that level into a business space. A new staircase was added, suggesting that it was at this time that the parlor floor was also converted to a shop. The new store did not become the home of a dress shop or millinery boutique, as some ladies in the neighborhood might have hoped. Instead The Potmend Company moved in. 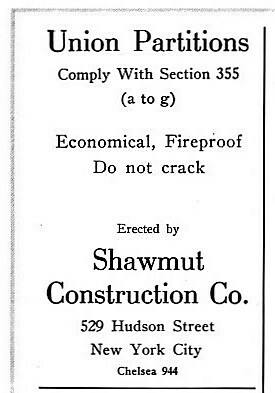 In July 1912 the Inland Storekeeper explained the firm's one product. There is a constant demand for a cement or adhesive for repairing broken china, bric-a-brac, toys, pots and pans, etc. 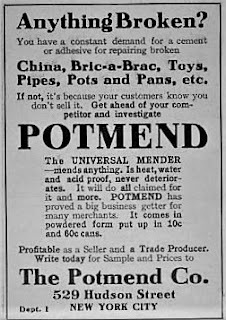 "Potment," manufactured by the Potmend Company, 529 Hudson street, New York City, fills every need of this kind. It is a universal mender--mends anything. It is a heat, water and acid proof and never deteriorates. 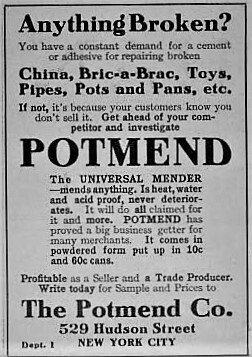 A retailer, the Pickering Hardware Company of Cincinnati, Ohio, chimed in, saying "We have sold several thousand cans of Potmend and have yet to hear of a dissatisfied customer, or a single complaint. We have, however, heard a large number of people sing its praise." The store was replaced two years later by the newly-organized C. H. & R. C. Peckworth company, a contracting firm. It was incorporated in January 1914. Charles H. and Ralph C. Peckworth would not only work from the building, but lived there. 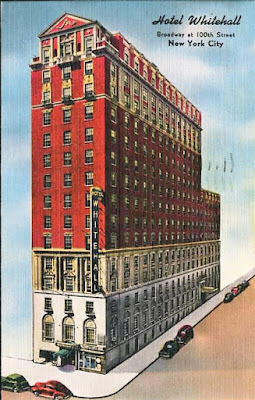 The firm was successful, landing a lucrative contract in June 1916, for instance, for the masonry work on the five-story Floersch Hotel in Perth Amboy, New Jersey. 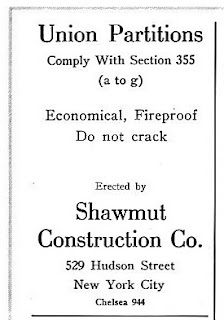 C. H. & R. C. Peckworth remained in the building through the World War I years, replaced around 1920 by the Shawmut Construction Company on one floor and the National Metal Bead Co. on the other. The commercial tenants continued to be less than glamorous. The Faber Iron Works was here for years, beginning around the beginning of the Great Depression until mid-century. Change in the Greenwich Village neighborhood caught up to No. 529 in 1978 when Inglenook Antiques took over the store space. The New York Times said on November 9 that year that it "has examples of nearly all of the Victorian subperiods, and specializes in three of them: American Empire, Renaissance Revival and American Eastlake." The store was a destination for antiques hunters until around 1988. That year the upper section was converted to one apartment per floor and the store became home to Crunch Aerobics Studio. Starting in 2010 chef Joe Ng of the Chinatown Brasserie and restaurant consultant Ed Schoenfeld opened an American-Asian eatery, RedFarm, in the space. Ng, deemed by The New York Times food critic Florence Fabricant "a dim sum specialist," announced he would serve "some unusual dim sum, including saffron soup dumplings and Peking duck sliders." The restaurant was a hit and four years later Time Out New York commented that the "high-end ingredients and whimsical plating [of the] interpretive Chinese restaurant have helped pack the narrow contemporary dining room since opening night." Nearly 195 years after its completion and having survived decades of various uses and remodeling, No. 529 Hudson Street survives unnoticed by most. Prolific architect Clarence Fagan True was responsible for scores of structures Upper West Side, many of them constructed by his own development firm, the Riverside Building Company. In 1896 he began construction of a row of six Elizabethan Renaissance Revival style homes which wrapped the corner of West 77th Street and Riverside Drive. Anchoring the three 77th Street residences was No. 334. Completed in 1897, it was faced in beige Roman brick and trimmed in limestone. Like the preponderance of Fagan's residences, it was designed on the American basement plan (meaning there was no stoop). Its bowed facade rose four stories to a stone balustraded balcony which fronted the mansard roof level. True outlined the upper windows in stone Gibbs surrounds and gave the entrance a full dose of architectural drama. The doorway was recessed below a carved Renaissance-inspired hood, supported in turn by manorial lion-faced brackets. On July 3, 1897 Leopold Wallach purchased No. 334 for $50,000--just over $1.5 million today. He was one of the trustees of the inheritance of his 20-year old sister, Gertrude. Their father, Samson Wallach, had run the shirt manufacturing firm of H. Wallach's Sons and upon his death in December 1889 The New York Times noted he had "an ample fortune." Gertrude, one of seven surviving Wallach children, lived with Leopold's family. He and the other trustees of Gertrude's money most likely purchased the imposing residence in anticipation of her upcoming marriage. Almost simultaneously her financé Myron Irving Borg graduated from Yale. The son of Simon Borg, he lived in a the family's impressive mansion at No. 855 Fifth Avenue. On Wednesday, October 26, 1898 the couple was married in Leopold's home. The bride was still enrolled at Barnard College at the time. Gertrude was, by now, of age and the title of the house was transferred to her name. The already comfortable financial position of the Borgs was improved in 1899 when Myron was admitted as a full partner in his father's stock brokerage firm, Simon Borg & Co. As the years passed they would have three sons--Myron, Jr., Cecil and John. The family maintained two Connecticut country residence--in Stamford and in Greenwich. There Gertrude flexed her gardening skills, resulting in her repeatedly winning prizes in the annual exhibitions of the New York Horticultural Society. Both she and her husband were active in philanthropic causes. Gertrude routinely opened the 77th Street house for meetings and benefit receptions for charities like the Stony Wold Sanitarium (a facility in the Adirondacks for women and children suffering tuberculosis), the Council of Jewish Women, and the National League of Women Workers. She helped found the Women's Auxiliary Board of Mt. Sinai Hospital, was a vice president and director of the Altro Health and Rehabilitation Services, Inc., (a workshop for handicapped adults), and would be named vice-president of Irving House, a shelter for children with cardiac disease. No less involved was Myron, who was a trustee in the Hebrew Technical School for Girls, a director of the Home for Aged and Infirm Hebrews, and was on the advisory committee of the Irvington House for Cardiac Children. The family was at the Stamford house in the summer of 1907 when a drive ended with a speeding ticket. On July 29 their road car was pulled over and chauffeur Charles W. Stobble fined $20. Newspapers reported that several other drivers were ticketed that day as the Stamford police had lost patience with speeders. The ticket--an astounding $1,350 in today's dollars--was hopefully paid by Borg and not his unfortunate employee. Near the family's Greenwich home was the sanatorium of Dr. W. H. Wiley. On the windy night of December 28, 1911 the wooden building caught fire. Inside were 20 patients. The wind accelerated the blaze which quickly spread. The staff had no time to wait for fire fighters. The Richmond, Virginia newspaper, The Times Dispatch, reported "Dr. W. J. Wellington, the house physician, and Mrs. Wiley and the nurses risked their lives time and again in carrying out the men and women patients, many of whom were unable to move." The winds carried sparks and embers into the night sky. Both the Borg house and the nearby Henry O. Havemeyer mansion caught fire. Luckily for the millionaires, their homes were saved when firefighters arrived on scene. The sanatorium, however, was a complete loss. Although the enactment of Prohibition outlawed the “manufacture, sale and transportation of intoxicating liquors," the law allowed private citizens to keep and enjoy "in the privacy of their homes" the wine, beer or spirits which they already had before January 1920. Perhaps Myron had prepared for the coming law, or perhaps he had always kept a well-stocked cellar. In either case, when the sale and manufacturer of alcohol became illegal, his cellar was well-filled with quality wines and liquor. In March 1920, just over a month after the national enactment of Prohibition, Borg hired three men to do repairs on the damaged brickwork in the basement of the house. On March 22 The Sun reported "They worked for several hours until they discovered the cellar." The workmen summoned a friend who had a wagon. The newspaper continued "while Mr. Borg's family and the servant thought the cracks in the bricks were being filled up the bottles were being taken out to the wagon." When the basement became suspiciously quiet, a servant went down to check. "All the workmen left were their discarded implements and an old coat." The New-York Tribune reported "Thirty-six bottles of extra fine liquor, said to be worth $1,000 were removed from the cellars of Myron I. Borg, banker, at 334 West Seventy-seventh Street." The loss would equate to more than $12,000 today; but perhaps worse for Borg was that it was now irreplaceable. Myron, Jr. graduated from Harvard in 1917. His engagement to Josephine Heimendinger was announced on March 13, 1923. The wedding took place in the ballroom of the St. Regis Hotel a week later. John was his brother's best man and Cecil acted as an usher. A reception and dinner for 200 guests followed the ceremony. The marriage, incidentally, did not last. A few years later Josephine's romantic interest turned to her brother-in-law, Cecil Borg. She and Myron were divorced on August 10, 1931 and exactly two months later Josephine married Cecil. One imagines strained family relationships from then on. Gertrude sold No. 334 in 1927 and she and Myron moved to No. 270 Park Avenue where Myron died four years later. Gertrude lived until the age of 82. She died in Stamford on August 17, 1958. In the meantime, the home that she had shared with Myron and their children was altered immediately after its sale. The new owners rented rooms in the once-lavish home, earning them a multiple dwelling violation from the Department of Buildings in 1936. A renovation in 1966 resulted in a duplex on the first and second floors, and two apartments each on the floors above. Three decades later the duplex grew to a triplex, the fourth floor now had two apartments and the fifth just one. But despite the upheaval inside, little is changed to the exterior of the handsome house Gertrude Wallach purchased in anticipation of her 1898 wedding. By the first decade of the 20th century theaters and night clubs were appearing on the Upper West Side, eliminating the inconvenient trip to the Broadway entertainment district downtown. The Carlton Terrace was a noticeable addition to the trend. 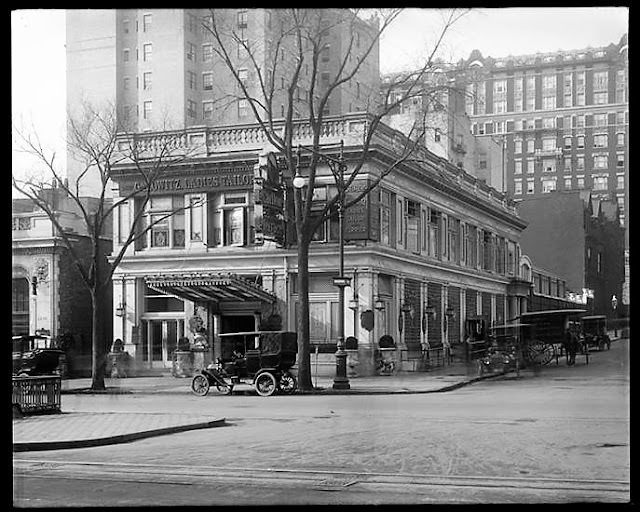 Located at the southwest corner of Broadway and 100th Street, the one-story nightclub and restaurant opened in October 1911. An advertisement in The Sun offered "Come where the music, the cuisine, the service, the decorations, all blend in perfect harmony. Where 'dull care' dare not enter, where 'good fellowship' sits high on his throne and rules with a kindly hand." Although the structure was just one story tall, the nightclub extended one floor below the street. And the owners anticipating using the roof as a third level. Earlier The New York Times had reported "The plans call for a garden covered with glass and equipped with a heating apparatus." This "winter garden," open year-round, would seat 400 and took its inspiration from the seasonal roof gardens throughout the city, so popular during the summer months. The newspaper said "The garden, as well as the dining room, will be decorated in Japanese style." In a clever decorating scheme, hanging from wooden arbors would be clusters of glass grapes which doubled as light fixtures. The rooftop plans, however, would have to wait for now. The refined neo-Classical architecture reflected the high-toned atmosphere inside. Patrons of upscale Edwardian nightspots were expected to dress the part; and female diners at the Carlton Terrace glittered in jewels, their escorts sporting white tie. An evening at the Carlton Terrace would include musical entertainment and dancing. The ala carte menu, while including the obligatory French cuisine, was heavily American, offering lamb kidneys with bacon, spring turkey, and a variety of steaks. Dinner prices were affordable. Two lamb chops, for instance, cost 50 cents--around $13 today. So when side dishes, desserts, and such were added, the price not including wine would amount to around $30 a plate today. But a bottle of wine averaged $5--adding about $129 in today's dollars to the bill. One entertainer was the victim of a bizarre crime in 1912. Around 2:30 on the morning of June 22 singer Margaret Mudge returned to her studio apartment on West 46th Street. Her door had been jimmied opened and, according to detectives, "every drawer, wardrobe and desk had been rifled." The burglars had made off with $3,500 in gowns and jewelry, including heirlooms, and $50 in cash. But what was most astonishing was the thieves' audacity. The Sun reported that they "set the dining table and enjoyed a hearty meal of roast chicken. When Detectives Fitzpatrick, Cooney and Burgess arrived at 3 A. M. yesterday in answer to a telephone appeal from Miss Mudge the remnants of the supper were still on the table." At the time of the entertainer's unnerving incident, the city's nightclubs and restaurants were suffering a waiters' strike. Joseph Pike, the proprietor of the Carlton Terrace, wanted to avoid a disruption in service at nearly any price. He preempted a walkout on the night of May 31 by "hurriedly" telephoning the union secretary "assuring him that [he] was ready to accede to the union's demands," reported the New-York Tribune. It was a publicity coup for the union. Two days later an official proudly displayed a note from Pike "asking him to take care of the Saturday night rush," according to the newspaper. It added "The sixteen knights of the napkin were quickly collected from the crowd of idlers hourly growing larger around the headquarters, and sent up to the tractable establishment." The following spring the plans for the roof garden were implemented. It opened in April 1913, doubling the overall seating capacity to 800. An advertisement on April 5 called it "a veritable fairy land in the heart of the metropolis" and "the most beautiful restaurant in New York." What was now a second floor "has been covered with a massive roof of glass, so that one has a sense of sitting in the open while enjoying the comforts of indoors. The Japanese decor led to afternoon dansants, or tea dances. An ad in The Evening World on February 6, 1914 said "The touch of daintiness that is seen in everything here is accentuated at the afternoon tea by the little Japanese maids who preside at the tea service." 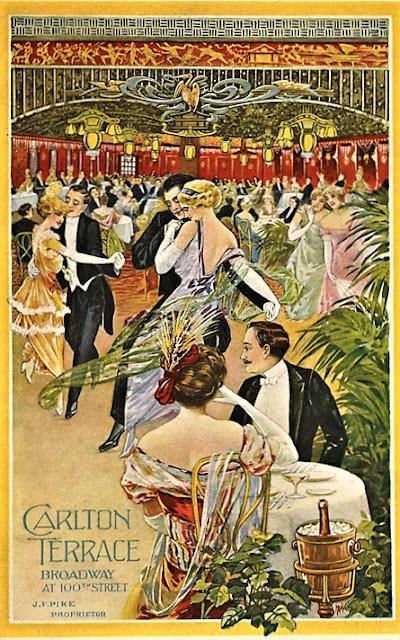 Careful not to over-emphasize these "delightful incidents" at the expense of the nightclub, the ad reminded readers "But keep in mind that Carlton Terrace will always seek to be known as a place whose kitchen is under intelligent direction." The popularity of the club was evidenced on New Year's Eve that year, when 750 reservations were filled. The Fox Trot was a favorite dance at the time, a craze reflected in the wording of The Sun's report of an accident on June 2, 1915. "The 'trotters' in the Carlton Terrace Restaurant...were astonished shortly before midnight last night by the sight of the front part of a taxicab suspended half-way over the tables hanging from one of the ornamental windows of the dining room." The restaurant's setting below street level allowed for a dramatic stairway entrance and increased ceiling heights. So when the cab crashed through the 100th Street window, it teetered above the tables where diners had just stepped away to the dance floor. "The machine made its entrance with a crash of glass that showered where but a few seconds before, when the music began, the patrons had been eating." About half a dozen motorists helped pull the automobile out of the hole it had made. The Sun added humorously, "The dancers, who had stopped at the noise, some believing that an innovation in surprises had been devised by the management and others fearing that the reform inspectors were adopting militant tactics, resumed their trotting." Joseph S. Pike was still the proprietor of the Carlton Terrace in 1919. He purchased the building in November that year; and in March 1920, no doubt in reaction to the newly enacted Prohibition, he made a significant change by leasing the top floor to commercial shops. Like many other posh nightclubs, however, the Carlton Terrace kept a secret stock of alcohol for its moneyed customers. And also like many other establishments, it became a target for Prohibition agents. On the night of November 20, 1921 three young men and women dressed in evening clothes entered at around 11:30. Having had an "elaborate meal," one of the men asked the water, Paul Avril, if he had any whisky. Avril returned to the table with two pints of whisky, which cost $10 (over $130 today). When the patrons identified themselves as Federal agents and displayed their shields, Avril ran to the kitchen. The New York Times (no doubt dramatically exaggerating the number of guests that night) reported "Upward of one thousand five hundred diners in Carlton Terrace, Broadway and 100th Street, one of the largest and most popular of upper Broadway restaurants, were startled early yesterday morning by the sight of one of the waiters running rapidly through the dining room and into the kitchen, followed closely by three young men in evening dress." The shocked patrons heard the loud crashing of glass and china. "Everybody stopped eating and awaited expectantly the outcome of what obviously was a big battle raging in the kitchen." Calm resumed after the waiter was led out in handcuffs. The following year, in August, Police Officer Helen Thomas and Detective James Saylor, dressed as well-to-do patrons, were served whisky with their meal. Once again a waiter went to jail. As a result of the bust, agents came back and seized hundreds of bottles of beer, gin, wine and cordials. Prohibition led to the close of numerous hotels and restaurants; and was most likely the cause of the shutting down of the Carlton Terrace. The building was demolished shortly after the August raid, replaced by a $2 million, 250-room hotel "devoted strictly to the family trade." The new structure, which opened in November 1923, took its predecessor's name, the Carlton Terrace Hotel. In 1854 volunteer companies made up Manhattan's fire fighting force. Their members, who all had other jobs, lived near their firehouses. Called "laddies," they scrambled to the station on alarm of fire. That year a new group, Columbian Hook and Ladder Company No. 14 was organized in Greenwich Village. The property at No. 96 Charles Street, nearby the new police station at No. 100, was deemed a good location for its firehouse. In June 1855 a Board of Aldermen report recommended the property as the new firehouse. It was owned by Samuel D. Chase who lived nearby on West 11th Street. Only months earlier he had completed a house on the the site with a stable in the rear. If the need for a new fire company in the immediate neighborhood was ever in doubt, a fire one month after the Aldermen's report may have eliminated the question. Ironically, the blaze which broke out around 2:00 on the afternoon of July 16 was in the stable behind No. 96 Charles Street. It caused damages of about $100--nearly $3,000 today. This would not be the first time the city's architect was tasked with converting a residence into a firehouse. In 1854 an upscale home at No. 269 Henry Street was transformed for Americus Engine Company No. 6. The Charles Street house, too, would emerge as a handsome firehouse. The renovations were completed in 1857. As was typical, large, centered bay doors were flanked by entrances. The arched stone pediment over the bay doors was echoed above the upper windows. An understated sheet-metal cornice crowned the design. The ground floor held the company's brand new truck, constructed by Pine & Hartshorn in 1856, and its team of sturdy horses. The second floor held a dormitory, a library, and a "grand meeting room and parlor." The top floor housed equipment including racks for drying hoses, for instance, and a "trunk room." Members of the Columbian Hook and Ladder Company, No. 14 represented a wide variety of mostly blue collar jobs. The 1857 roster includes clerks, cartmen, three ice dealers, several carpenters, two painters, a locksmith, a bookbinder and a grocer. There were also one silversmith and a jeweler in the group. The "laddies" came and went as their schedules demanded; but one member, Peter W. Fraleigh, lived here full-time. A few weeks after the Civil War broke out Colonel Elmer E. Ellsworth, a personal friend of Abraham Lincoln, organized the 11th New York Volunteer Infantry Regiment, composed entirely of fire fighters. Several of the member of Columbian Hook and Ladder Company, No. 14 joined the unit known popularly as the Fire Zuoaves. The group quickly saw action, winning a battle in May 1861 almost immediately upon arriving in the South. The enemy's flag was sent home. On June 1 The New York Times reported "The first Confederate flag taken in Virginia by the Fire Zuoaves, will be hoisted, union down, under the Stars and Stripes, on Sunday morning, at 10 o'clock, on the house of No. 14 Hook and Ladder Company, at No. 96 Charles-street." The firefighter soldiers would return home to a changing fire department. The Act of 1865, enacted on March 30, coupled Brooklyn and New York with a paid “Metropolitan District” fire department. The volunteer companies were disbanded and No. 96 Charles Street became home to the new Hook and Ladder Company No. 5. The unit's importance in squashing the many fires in the district was evidenced in January 1884 when the Fire Commissioners decided to "double up" Hook and Ladder Company No. 5 by providing an additional truck and "a sufficient additional force...to man the reserve apparatus." Most fire houses acquired a mascot and Hook and Ladder Company No. 5 adopted Ginger in 1882. The New York Times described him as "a nondescript dog, pedigree unknown." The mutt was a favorite among neighborhood girls who "stopped at the truckhouse on their way to and from school for a romp with 'Ginger.'" But Ginger was more than a playmate, he was a true fire house dog. "Ginger was essentially a fireman's dog and took an almost human interest in the affairs of the company. He was prompt to answer alarms of fire, and when the truck rolled out of the quarters his short, sharp bark mingled with the gong's louder tones as he ran at the head of the horses," wrote The Times. But then, on November 17, 1888, 16 years after the dog first arrived at the firehouse, The New York Times ran the headline "Ginger Is No More." Ginger was "taking his constitutional walk in Bleecker-street," the day before when he was run over by a truck. A policeman, recognizing that the dog's wounds were fatal, ended its misery by shooting it in the head. Ginger's body was laid out with dignity in the side yard of the firehouse. "When his death became known yesterday to the school children they thronged to the truckhouse for a last look at their pet." He was buried there the following day. Possibly, Ginger's unmarked grave still exists in the adjoining yard. The galloping horses pulling the heavy fire equipment presented a danger to vehicles and pedestrians despite the loud gongs of the trucks' bells. When a fire erupted at No. 8 West 13th Street on the afternoon of November 18, 1901 Hook and Ladder Company No. 5 responded. Mrs. Mary Smith, a missionary of the Church of the Strangers, stepped into the street directly in the path of the charging fire truck. The Evening World reported that the driver "tried to save her" by veering the truck; "but the horses knocked her down." The fire truck then ran directly into a street car. Hook and Ladder Company No. 5 never made it to the fire and Mary Smith was removed to St. Vincent's Hospital. The company appeared in the press most often, however, for the heroics of its members. Such was the case on March 9, 1921 when fire tore through the apartment of J. W. Ferrington at No. 249 West 11th Street. Ferrington was an invalid, unable to get out of his smoke-filled rooms. Fire fighters broke in the door to find that "flames were sweeping across the rooms," according to The Evening World. Fireman Hogan dropped to his hands and knees and felt his way through the apartment. Other fire fighters aimed their hose directly on him. "The only possible manner by which he could penetrate the flames and smoke was by the protection of streams of water constantly played upon him, and in this manner he went from room to room." Hogan finally found Ferrington, who had managed to tumble out of the bed. He was crouching by a window, trying to breathe. The newspaper reported that Hogan "dragged him to the hallway, the water drenching both throughout their progress." In the meantime, the fire spread to two apartments on the floor above. Mrs. Simon J. Medico was visiting with her 8-month-old son, Simon, Jr. on the fifth floor. She "became hysterical when she found her way blocked by smoke and screamed from a window." She managed to climb part way down the fire escape and pass her baby to a neighbor in an adjacent building. The fire also extended into the apartment of Daniel J. Phelan, whose 16-year-old son, Edward, rushed upstairs after the blaze was extinguished. The Evening World explained he needed "to assure himself of the safety of two pet canaries and his first long trousers. The smoke had killed the canaries, and the flames had burned the legs off the trousers." In 1936 the Charles Street block was renumbered, assigning the firehouse the new address of No. 102. 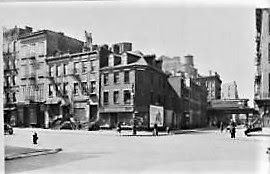 A five-alarm blaze on June 20, 1942 wrecked nearly the entire Greenwich Village block bordered by Hudson, Washington, Leroy and Clarkson Streets. The inferno resulted in 50 injuries to fire fighters, $15 million in damages by today's standards, and the total loss of Hook and Ladder Company No. 5's truck. At one point, according to The New York Times, "The north wall crashed with a tearing, crunching sound and a barrage of flying bricks...Hook and Ladder Truck 5, stationed at 102 Charles Street, and accordingly one of the first pieces of apparatus to respond, fared worse than any of the men." The truck had been pulled "close in" on Leroy Street. When the wall smashed down, it flattened the fire truck. Amazingly, warned by a large crack that appeared in the masonry, all of the fire fighters escaped. As had been the case in the 1880's, Hook and Ladder Company 5 had a mascot. This one, named Prince, was no mutt like Ginger, however. He was a pedigree Dalmatian--the iconic fire house breed. The men of Company 5 held their dog in such high esteem that they entered him in the special fire dog category in Brooklyn Kennel Club Dog Show on December 3, 1949. 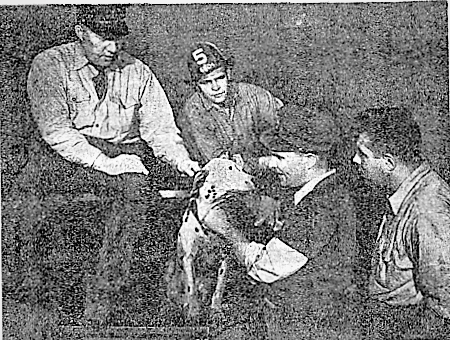 A month earlier, on November 24, The Times reported "Firemen are stealing a little time from polishing brass these days to groom their Dalmatians for the special competition." Fire Chief Joseph J. Scanlon tried to discourage the practice of fire dogs, telling a Times reported "Officially, the department has no interest in dogs," adding "A firehouse is no longer a good place for a dog in these high-powered, mechanized days. They may fall off the speeding trucks answering an alarm, or get run over or they sometimes get lost in the crowded city. The average life of a firehouse dog is not much more than one year today, I'd guess." The cold water the chief threw on the event did not discourage the men of Hook and Ladder Company No. 5. Prince was shown at the show by Fireman Leonard Smith. Because it was a special category, no award was given. It was cats which caused problems to the fire fighters 11 years later. In the fall of 1960, unknown to the men, two feral cats took up residence in the basement. One had a litter of kittens there. They were not the only new residents. On September 11 the men began scratching. One by one they showed signs of bites until, as reported by The New York Times, "After two days of scratching, the company captain, Benjamin J. Ciranna, complained to Battalion Chief Cornelius P. Harrington." 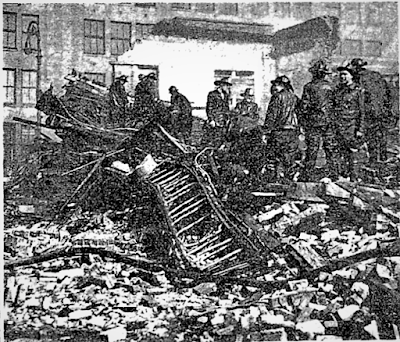 Chiefs Harrington and Otto H. Knochenhauer went to the firehouse to investigate. They were promptly bitten. A Fire Department spokesman said "investigation proved the invaders were not gnats or mosquitoes but straight out-and-out fleas--the dog type." The firehouse was vacated. The Times quipped "The twenty-five officers and firemen of Ladder Company 5, victors over raging holocausts, collapsing walls and barricades of beams, have been forced to retreat before an ignoble enemy--an army of fleas." The truck and its men were temporarily lodged at Engine Company 24 at No. 78 Morton Street. Pioneer Exterminating Company spent three days in the firehouse, fumigating it with a "machine vaporizer." The firefighters returned home on September 16. The 136-year history of No. 102 Charles Street as a firehouse came to an end in 1993. A renovation, completed the following year resulted in a store at street level and one apartment each on the upper floors. For years the ground floor, formerly home to horses and then motorized fire trucks, held the Plane Space art gallery. It houses an upscale handbags and accessories boutique today.